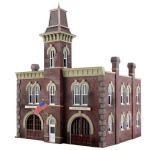 Set Built-&-Ready structures on your layout right out of the package! These hand-painted and fully detailed buildings are great for building cities, towns and villages. Molded with high architectural detail, Built-&-Ready structures include realistic weathering, signs, fixtures and add-ons.